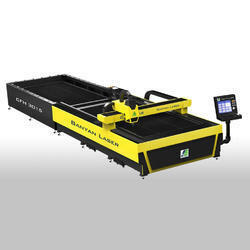 We are one of the leading manufacture and supplier of Fiber Laser Cutting Machine. 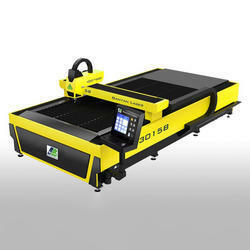 Our offered products are Plywood Range, CNC Router and Fiber Laser. Specially used for cutting 0.5-6mm carbon steel, 0.5-5mm stainless steel, 0.5-2mm aluminum, 0.5-1mm brass and other metal material, The effect of cutting speed and cutting section of superior performance. Fiber laser design, simple operation, free maintenance. USES the import original servo drive-Panasonic, precision ball screw to the system, high cutting precision. Using the latest product configuration, cutting section effect is perfect, cutting speed leading industry for more than 20%. 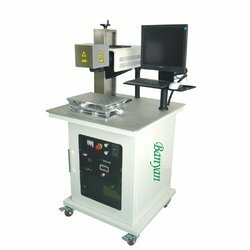 Application: Fiber Laser Marking Machine Is Used To Mark Or Engrave On All Metals, Alloy, Oxide, ABS, Epoxy Resin, Non-Metals Material. It adopts full aluminum workbench plate featured with high bearing capability, solid, and durableness, section integrated elevating frame is solid and stable, with strong resistance to shock; with strong commonality, it is suitable for all kinds of industries, equipped with scale plate, its marking and location are precise and easy, the large working bench is capable to realize the continuous marking within tthe large scope. The fiber laser marking system adopts the integrated design, with compact size, low consumption, long life-span, high efficiency, free from maintenance, with superior laser beam, and precise light spot, it is no need of consumable items. The scanning galvanometer is imported with original packaging, with good seal, capable to prevent dust and water, small volume, compact and solid, and the performance is superior and power is excellent. With german marking machine software and controlled usb interface, the transmission is swift, stable, with digital transmission function and the software operation, is easy and of strong functions. It is widely used in the electronics separation components, integrated circuit, electrical engineering circuit, mobile communication, hardware, tools, kitchen wares, tool fittings, precise apparatus, eyeglasses and clock, computer keyboard, jewelry accessories, plastic buttons, water heating fittings, sanitary ware, pvc pipelines, medical apparatus and packing container, etc. It adopts full aluminum workbench plate featured with high bearing capability, solid, and durableness, section integrated elevating frame is solid and stable, with strong resistance to shock; with strong commonality, it is suitable for all kinds of industries, equipped with scale plate, its marking and location are precise and easy, the large working bench is capable to realize the continuous marking within tthe large scope. The fiber laser marking system adopts the integrated design, with compact size, low consumption, long life-span, high efficiency, free from maintenance, with superior laser beam, and precise light spot, it is no need of consumable items. The scanning galvanometer is imported with original packaging, with good seal, capable to prevent dust and water, small volume, compact and solid, and the performance is superior and power is excellent. With marking machine software and controlled usb interface, the transmission is swift, stable, with digital transmission function and the software operation, is easy and of strong functions. Specially used for cutting 0.5-12mm carbon steel, 0.5-6mm stainless steel, 0.5-3mm aluminum, 0.5-2mm brass and other metal material, The effect of cutting speed and cutting section of superior performance. 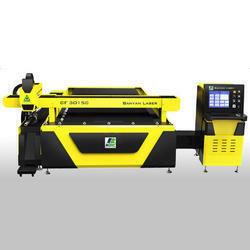 Used the import original laser machine in the United States, stable performance, quality assurance. 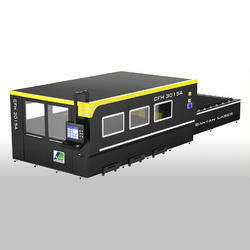 The whole machine is designed simply, the outward appearance is beautiful and easy, saves the customer investment costs. The exchange workbench, automatic blanking, save operation time and improve production efficiency. Specially used for cutting 0.5-6mm (300W 0.5-3mm) carbon steel, 0.5-5mm (300W 0.5-2mm) stainless steel, 0.5-2mm aluminum, 0.5-1mm brass, and other metal material, The effect of cutting speed and cutting section of the superior performance. One whole set design, it can be assembled quickly, cover small area, save space. Double driver systems with precision gear and rack. Rapid positioning. Specially used for cutting 0.5-12mm carbon steel, 0.5-6mm stainless steel, 0.5-3mm aluminum, 0.5-2mm brass and other metal material, The effect of cutting speed and cutting section of the superior performance. 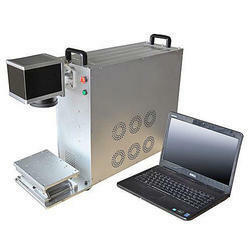 The whole machine is designed by one set, it operates safely, and reduce the laser radiation.